Are you a woman? Would you like to be our country’s ambassador to the United Nations, where you will be tasked with gutting aid for refugees but will have very nice curtains? 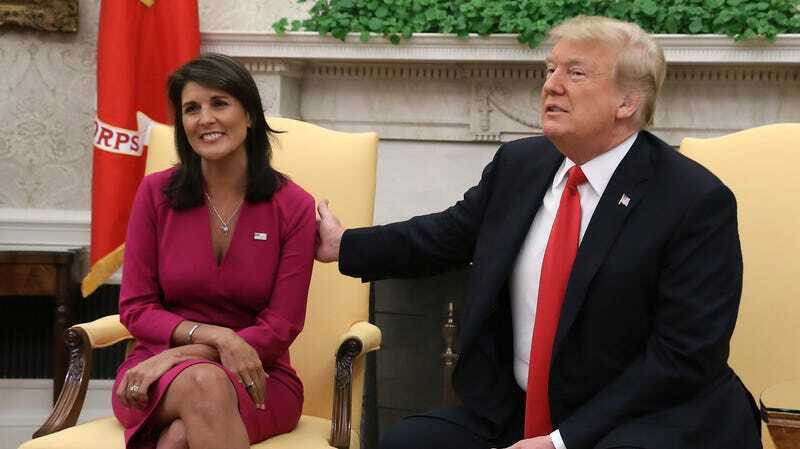 The job will be opening up soon, as Nikki Haley, the current U.S. ambassador to the UN, announced on Tuesday she’ll be leaving the post by the end of the year. Already, White House aides are drafting up a list of women to fill the job, hoping that appointing someone who is not a man will improve Trump’s approval ratings with women, which a recent Pew Center poll put at a dismal 30 percent. Kay Bailey Hutchison, the former Texas senator and now our NATO representative, who as a native Texan I can safely say is bad but is probably the least terrible of all of the options listed above. I don’t know about you, but looking at this list of women, I have totally gotten over my rage at the appointment of an alleged sexual assaulter and a habitual liar to the Supreme Court.